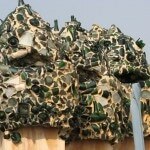 La Pedrera, also known as Casa Mila, is yet another proof of the geniousity of Antoni Gaudi. 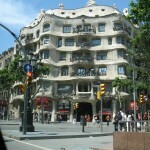 The building is located along Passeig de Gracia, and was built at the current location between 1905 and 1910. 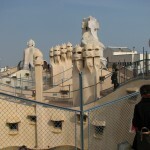 The building was originally built for Rosario Segimon and Pere Milà, but today it is owned by Fundacio Catalunya-La Pedrera. La Pedrera was in very bad condition until the start of the 1980s, when they finally spent money renovating and getting this beautiful building back in shape. Since then it has become a part of Antoni Gaudis World Heritage Sites. According to Wikipedia Gaudi only allowed the lifts to stop on every second floor, thus creating more chances for the owners to meet walking around on the different floors.